In this situation the correct connection is . A play at a also connects but everything can happen yet. Black can choose to exchange the cut for an urgent move elsewhere. Playing is safer. Notice that both and a have a MonkeyJump relationship to the stones to be connected. 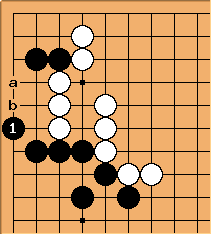 See Beginner Exercise 108 for why the supposed small knight's move connection at b fails. 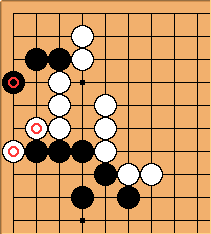 Dieter: If you don't mind, I'd rephrase your statement as A play at a also connects but represents a greater loss if later in the game Black decides to give up the two stones, for example ignoring a ko threat.